The reintegration process for survivors of human trafficking should lead to sustainable reintegration, preventing re-victimization and re-trafficking. Though service providers generally have many years of experience and staff are well trained on case management, monitoring of countering trafficking in persons (CTIP) programs often reveals that many assisted survivors are not provided with a comprehensive range of services responding to their needs.This puts these survivors at-risk of being trafficked again. The absence of an efficient social welfare system in countries of intervention and a lack of service providers are often blamed for this deficiency, and many CTIP programs continue to waste resources with palliative aids to survivors not leading to sustainable reintegration. 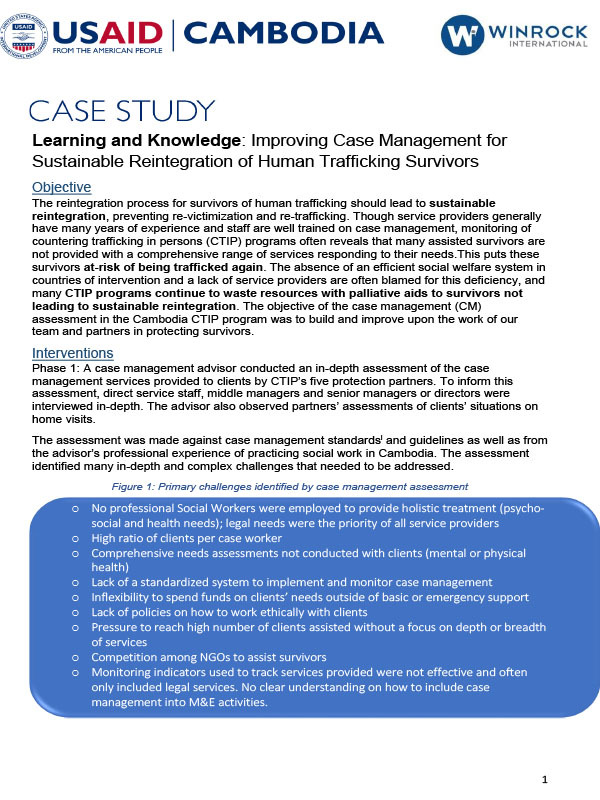 The objective of the case management (CM) assessment in the Cambodia CTIP program was to build and improve upon the work of our team and partners in protecting survivors.